Holy canolis, have we been busy! I thought that summer was going to be a relaxing time! Boy was I wrong! Can we go back to school yet? 🙂 LOL! 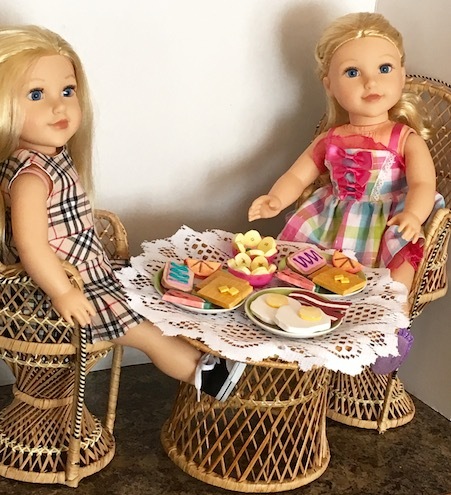 Anyhoo, I finally have about an inch of time, so I thought that I would do a post about doll food. 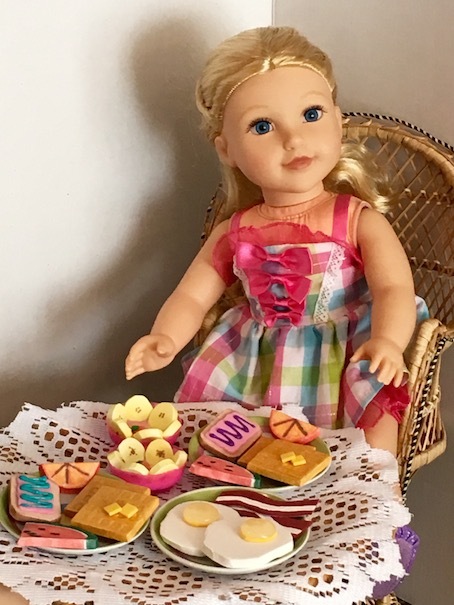 Actually, what I want to do is a whole series on the food and accessories that we’ve made for the dolls out of something as simple as craft foam. So hold on tight, because we are going for a doll food ride! We will start with breakfast (my favourite meal of the day), and then each day we will be posting another meal, so stay tuned! 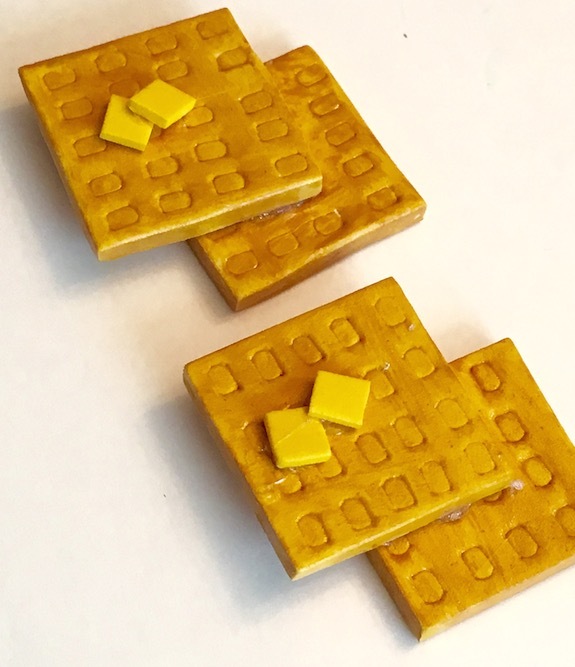 Waffles – Cut squares of thick craft foam. We used the end of a chopstick to press a pattern into the top. Paint or use a marker pen to colour your waffles. Tip: If you use markers, colour your foam, and then use your fingers to smudge out the pen marks. The foam can be easily stained this way, and the marker lines are gone! 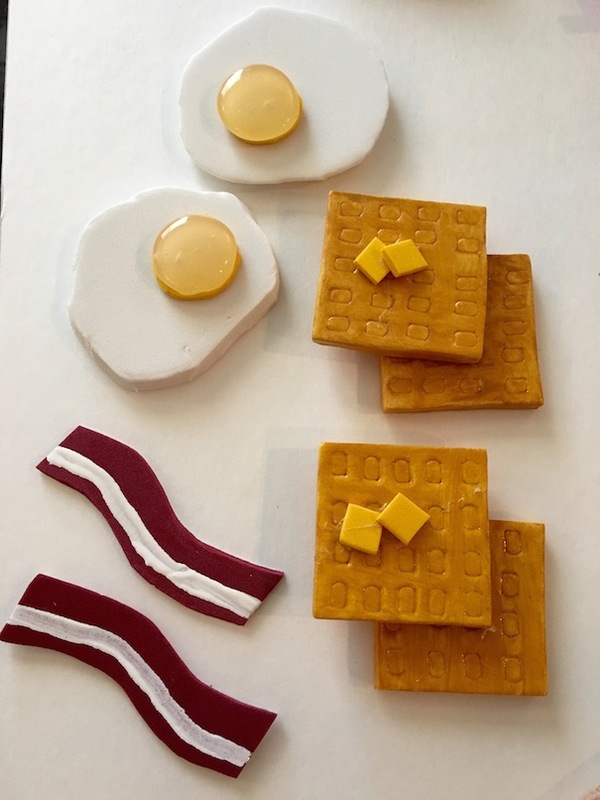 Use square pieces of yellow craft foam for butter. You can hot glue your waffles together or leave them separate, it’s up to you! You can also make pancakes this way by cutting out circles of thick craft foam instead. 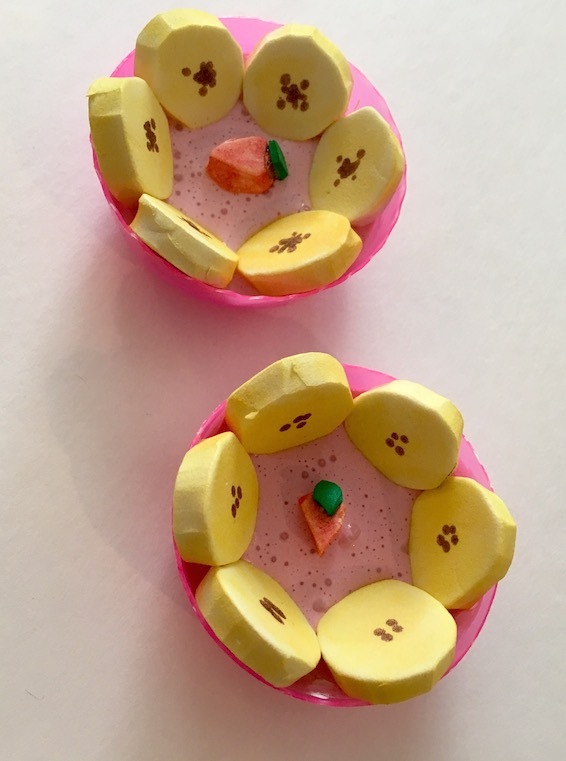 Citrus slice – Trace and cut a circle from thick craft foam. (I usually just press into the foam with a spice jar lid leaving a circle indent, but anything goes). Cut the circle in half to make two slices. Colour or paint the edges of the peel. 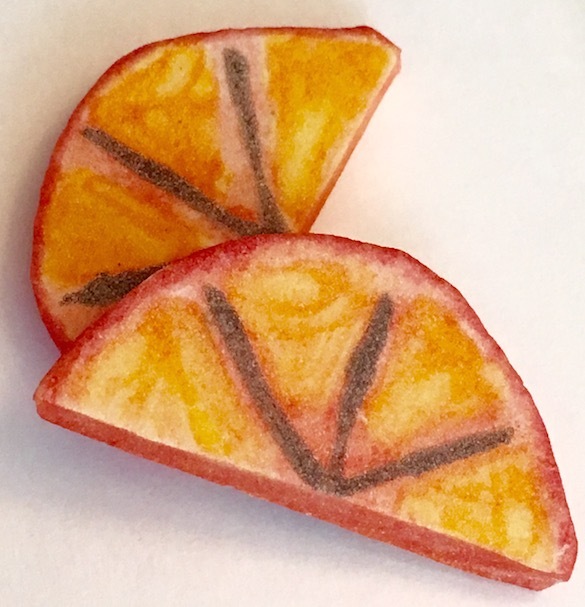 Next colour or paint the inner sections of your citrus fruit. You can make lemons, limes or orange slices this way. If you would like a peach slice for breakfast instead, just cut a tiny half circle from the centre of your orange slice. Then colour it solid orange with a darker orange peel. 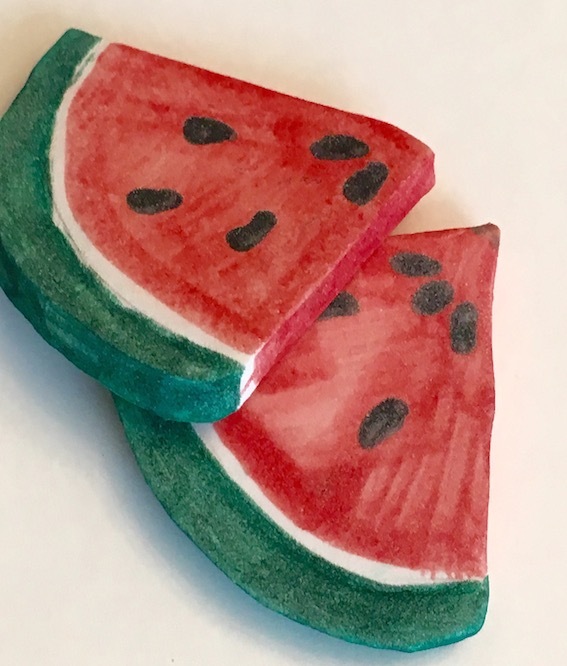 Watermelon slice – Draw a template on cardboard. This is just to ensure that you can get uniform slices. Press your template into thick craft foam. Cut around the indented line. (It is better not to trace with a pen or pencil as this leaves a line on the finished product). Colour or paint the watermelon rind green and the fruit red. Be sure to leave a tiny edge of white near the rind to make it look more realistic. Now add some black seeds. Eggs – Cut egg whites from thick craft foam. 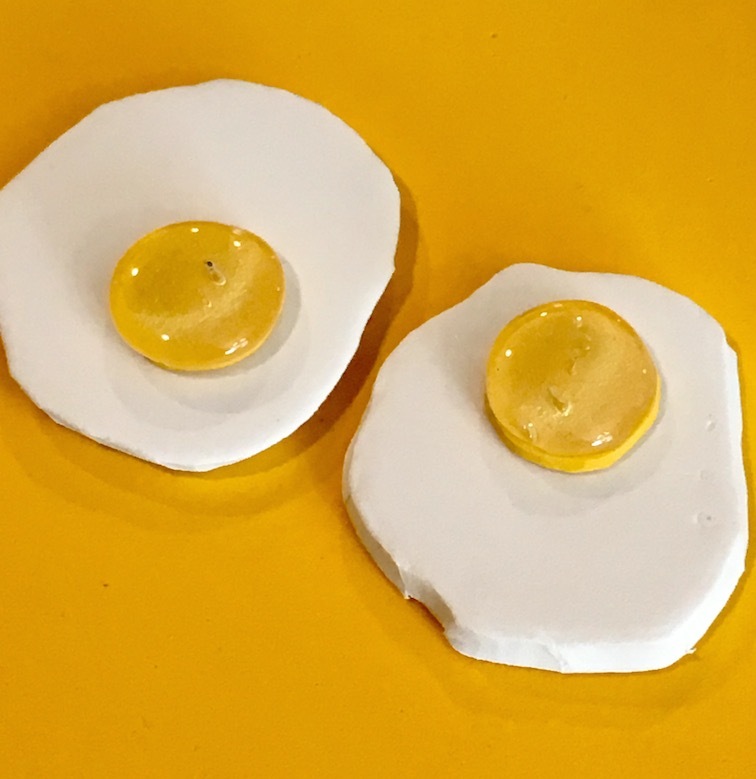 Cut egg yolks from thin yellow craft foam. Glue yolks to whites. Be sure to glue them off centre to make them more realistic. Add a blob of hot glue on top of the yolk. 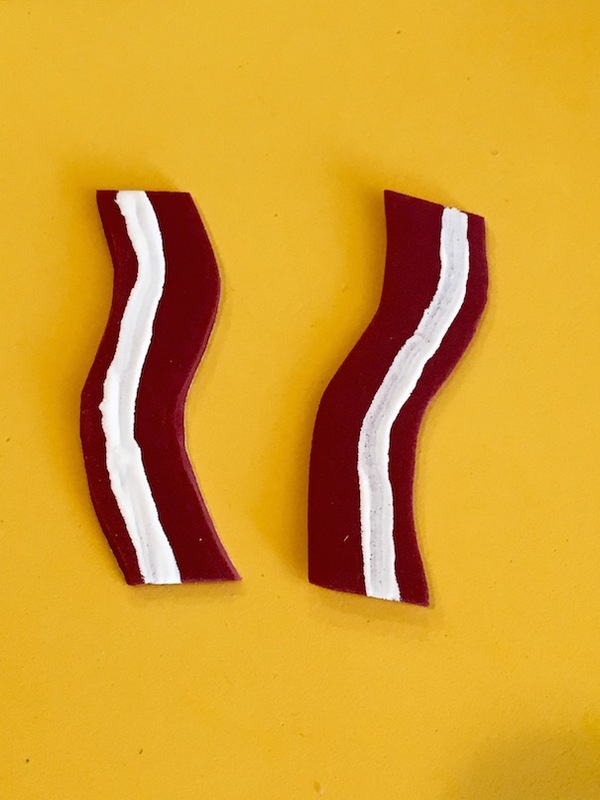 Bacon – Cut out two squiggly bacon shapes from dark red, thin craft foam. Using some white paint, draw a line down the edge of each piece of bacon. Make sure the white line is off center for realism. If your bacon seems too thin, you can always make it double thick by gluing another piece of the red foam on the back. This just makes it a bit stronger for play. If it is just for display or photos, then it shouldn’t be an issue. 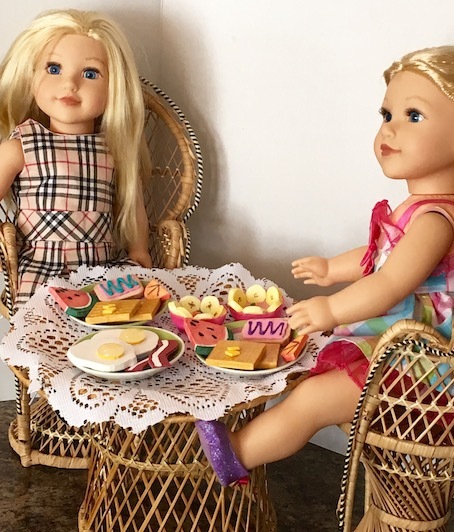 Pop Tarts – We don’t actually eat pop tarts, but I thought that we would make some for the dolls anyway. Cut out a square from thick craft foam. Round the edges. If you have a pair of pinking shears (lacy edged scissors) then you can use these to cut out the pop tarts. We don’t have any shears, so we just left them as is. 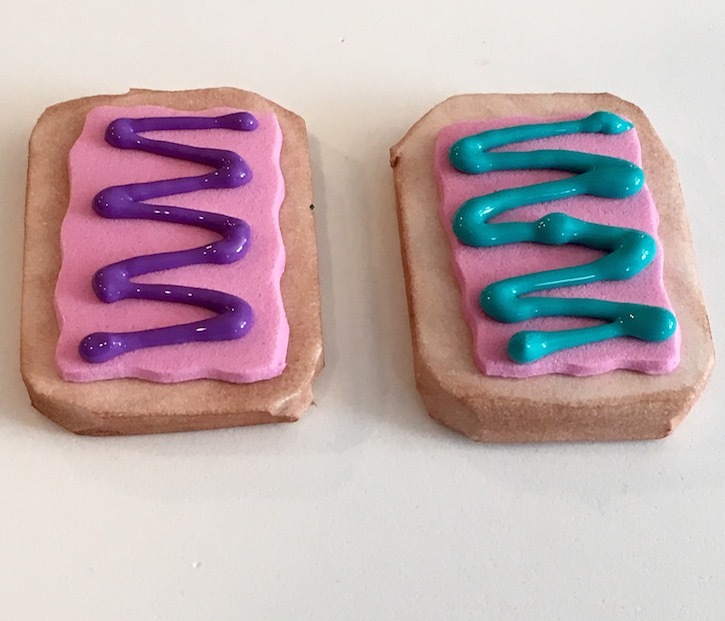 Since we’ve never eaten them, my daughter can’t tell the difference. 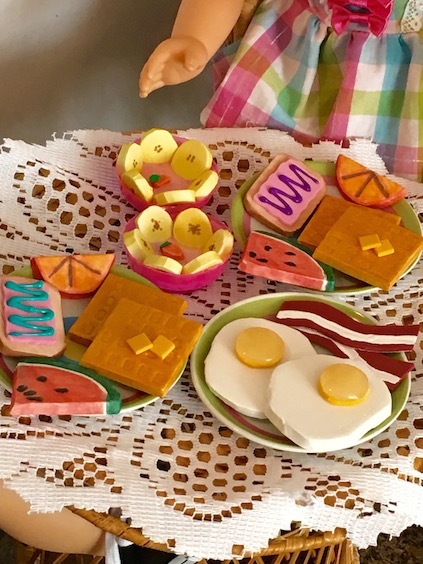 Actually, I think she thinks these are doll cookies. Lol! 🙂 Oh well. Next, colour or paint your pop tart. We used a tan brown marker to stain the foam. Cut a square of thin craft foam in the colour of your choice for the icing. Be sure that it is a bit smaller than the tart. Hot glue it on top. Use puffy paint to add a squiggle icing decoration. Yogurt – We found these pink ice cream sample cups at a trade show one year. I’ve always wanted to use them for the dolls. I had to cut them down to size, but they worked perfectly as yogurt bowls! You can use any doll bowl for this craft. Just know that it is permanent. First, fill your bowl halfway with tacky or school glue. Next, add blobs of red and white paint. Mix thoroughly. (If you want a different flavour of yogurt, then colour your glue accordingly. We wanted strawberry pink). Cut small circles from thick craft foam. Use a yellow marker to stain the circles yellow. These are your banana slices. Add a few brown dots in the middle of your banana slices on both sides for realism. Place your bananas around the inside of the bowl, pressing the bottoms gently into the glue yogurt. Cut a strawberry shape from thick craft foam. Colour it red. Then glue a piece of green craft foam for a stem. Place your strawberry at the centre of your yogurt bowl. Let everything dry completely. Summer and Holly are enjoying breakfast on the patio today. Okay, I seriously love eating breakfast outside in the garden. Who’s with me? I hope you enjoyed making breakfast with us today! Stay tuned tomorrow for our lunch special! 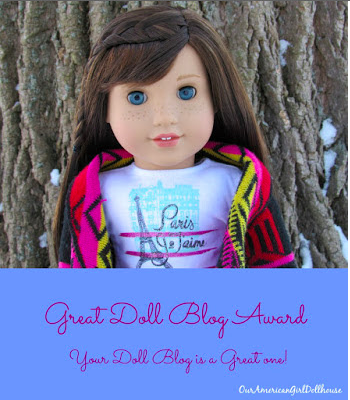 < Previous MEET THE DOLLS! Next > LUNCH FOOD SPECIAL! 🙂 Oh yes! 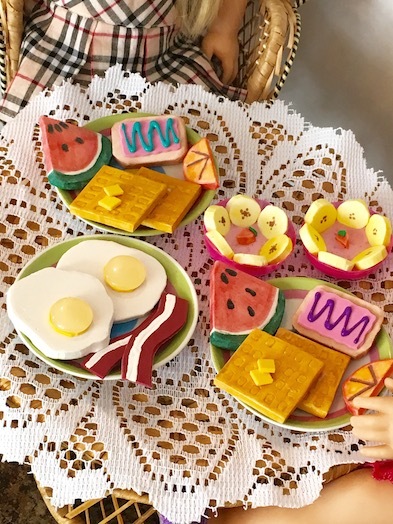 Breakfast is my absolute favourite meal of the day! There has to be lots of variety!